WASHINGTON (CNN) -- The Supreme Court nomination of federal Judge Sonia Sotomayor gained even more momentum Wednesday as two more Republican senators announced their support for the country's first Hispanic high-court pick. If confirmed, Sonia Sotomayor would be the nation's first Hispanic on the Supreme Court and its third woman. A new nationwide poll also showed that a majority of Americans now believe the Senate should confirm Sotomayor. Most Senate Democrats and Republicans, however, continued to express sharply differing opinions of Sotomayor's experience and temperament during the full chamber's second day of deliberations. Democrats praised the nominee as a fair and impartial jurist with an extraordinary life story. Many Republicans continued to portray her as a judicial activist intent on reinterpreting the law to conform with her own liberal political beliefs. Sen. Kit Bond, R-Missouri, broke with the majority of Senate Republicans when he took to the Senate floor to announce that he would vote for Sotomayor despite disagreeing with several of her rulings. "There's been no significant finding against her. There's been no public uprising against her," Bond said. "I do not believe that the Constitution tells me that I should refuse to support her merely because I disagree with her on some cases. I will support her, I'll be proud for her, the community she represents, and the American dream she shows is possible." Later, Republican Sen. Judd Gregg of New Hampshire also said he would vote in favor of Sotomayor's nomination, calling her qualified for the position. "Although Judge Sotomayor and I may not see eye-to-eye on all issues or share the same political ideologies, our democratic system should allow for such differences," Gregg said in statement. He lamented what he called the politicization of the judicial confirmation process, saying: "This is why I criticized the Democratic leadership's tactics to block highly qualified judicial nominees during the Bush administration, and these same principles still hold true for me now. Bond and Gregg increased to eight the number of Republican senators backing Sotomayor. They joined Maine's Susan Collins and Olympia Snowe, Indiana's Richard Lugar, Florida's Mel Martinez, South Carolina's Lindsey Graham and Tennessee's Lamar Alexander. Sotomayor's confirmation by the Democratic-controlled Senate is now considered to be a certainty. A final vote is expected by Thursday, and legal sources say a White House swearing-in ceremony could happen as early as Friday. If confirmed, Sotomayor, 55, would be 111th person to sit on the Supreme Court, and the third woman justice. Senate Democrats opened the second day of floor debate praising Sotomayor's 17-year record as a federal judge and her made-in-America story as a minority woman who rose to success through hard work and opportunity. "Here we have a nominee who has had more experience as a federal judge than any nominee in decades," said Sen. Patrick Leahy, D-Vermont, chairman of the Senate Judiciary Committee that approved Sotomayor's nomination after a four-day hearing. She has "real-world experience, real-world judging, (and) an awareness of the real-world consequences of decisions." Sen. Patty Murray, D-Washington, dismissed GOP charges of Sotomayor's alleged judicial activism, expressing confidence that she "will be a smart, fair, impartial, and qualified member of the United States Supreme Court,"
Sotomayor has been clear "that her own biases and personal opinions never play a role in deciding cases," Murray said. "More importantly, her 17 years on the bench stand as a testament to that fact." Most Republicans expressed a dramatically different view. Sen. Richard Burr, R-North Carolina, argued that Sotomayor's record indicates she relies "on something other than well-settled law to come to a decision. My fear is that she (is) unable to separate her personal belief system from that of the letter of the law." Burr highlighted Sotomayor's ruling in the 2008 case Ricci v. DeStefano, in which a group of 20 mostly white firefighters sued the city of New Haven after the city threw out the results of a firefighter promotion exam because almost no minorities qualified for promotions. The 2nd U.S. Circuit Court of Appeals, including Sotomayor, backed the city. The ruling was subsequently overturned in June by a 5-4 Supreme Court ruling. Sen. John Cornyn, R-Texas, agreed with Burr, arguing that a promise by Sotomayor in her confirmation hearings to "apply the law" in a neutral manner had been undermined by an activist judicial record. "I have no question about the outcome of this vote on Judge Sotomayor," Cornyn said. "I hope ... she will prove (my) concerns unjustified." As the Senate moves closer to a final vote, a new CNN/Opinion Research Corp. survey indicates a majority of Americans believe the chamber should confirm Sotomayor. Fifty-one percent of those questioned in the poll, conducted Friday through Monday, say the Senate should confirm Sotomayor, with 36 percent opposed. The 51 percent who back Sotomayor is up 4 points from a poll in June. The poll suggests the rise in support is coming solely from women. 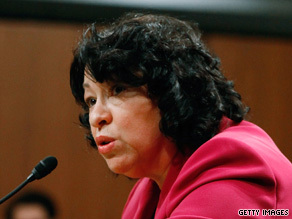 "Among men, there has been virtually no change in attitudes toward Sotomayor. Among women, however, support for Sotomayor's nomination appears on the rise -- from 47 percent in June to 55 percent now," said CNN Polling Director Keating Holland. The poll also indicates a wide partisan divide over Sotomayor, with nearly three out of four Democrats saying that she should be confirmed, but only a quarter of Republicans agreeing. The telephone poll of 1,136 Americans has a sampling error of plus or minus 4.5 percentage points. The sampling error is larger for the questions broken down between gender and political party.